One way to get quality content to fill your blogging editorial calendar is to host guest bloggers. A guest blogger typically submits a blog post (sometimes unique material but not always) that you feature on your site. It’s a fun way to get fresh content, to vary the voice of your site, and to feature an industry colleague. Does the guest blogger have a strong fan following that you want to be connected with? In social media, it’s all about influence and attention. If you can host a guest blogger who has the eyes, ears, and hearts of an audience you would like to be put in front of, then hosting them would make a lot of sense. They are sharing with you as much you are sharing with them. They will likely share the post with their audience and you will be presented there. Good move. 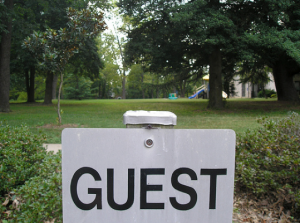 Is the guest blogger’s persona in alignment with yours? People will judge the guest blogger’s intent, message, and values the same way as they would if you were actually the one writing. It might not be fair, but association is powerful. Do not host someone who is not in alignment with your brand. You will be judged badly for it. Conversely, if you host someone with a more established reputation than you, it will certainly help for the same reason. Check their online presence out before you commit. Is the guest blogger a good writer? Maintain the standards of your site when choosing guest bloggers. Editing their work may not be a solution, as much of a writer’s voice comes from the way they use words. If dangling participles are your nemesis, then don’t host a blogger who dangles. Don’t try to rewrite the guest piece, except obvious misspellings and typos. Reworking would likely make the piece sound stilted. It’s better off finding a writer that maintains the quality standards you do instead of reworking. Is the guest blogger well connected on social and willing to promote? Partnering with people who are well connected on social media will help drive traffic and interest to your blog. The immediate and residual effect of someone else mentioning you is huge. The more mentions other people share about you adds to your online reputation and credibility. It’s one thing when you are pushing your own stuff. It’s another when someone else is doing it. Even though they would be promoting their piece on your site, it’s still your site they are promoting. You earn extra points if your guest blogger also has an in-house email list where they promote the post. That is good stuff! Does the guest blogger compete with you in business? I am not big on the whole “worry about the competition” meme so this is more for those of you who are worried about it. If you are that type, then pick a guest blogger that augments your line of work. Maybe, if you work with intermediate level people, find someone who works with rank beginners or visa versa. Find a blogger who works up or down stream in the work process from you. Find someone who does what you do but for a different industry. The strategic partnering and audience satisfaction possibilities that come from adding interest and freshness to your blog with a different viewpoint far outweighs most competitive concerns. You still have lots to decide. Will you require exclusive, non-published material from your guest bloggers or are you willing to republish an already existing post? What length of piece do you want them to write? Do they need to provide photos and graphics or will you take care of that? Will you allow them control panel or ftp access to upload the piece themselves or will your web person do that? Will you let them include promotional language? What promotional tasks would you like them to commit to once the piece is published? You can think of many other questions, I am sure, but generally speaking, this is a low risk adventure. Try it and test the results. I bet it will work out just fine.